PHOENIX (AP) — Federal agents arrested nearly 50 shuttle operators and smugglers Thursday accused of using vans to transport thousands of illegal immigrants from the Mexican border to Phoenix in what was billed as one of the government's largest-ever human smuggling busts. Investigators said the operators of four shuttle services in Tucson and a fifth in Phoenix created their businesses solely to help immigrant smugglers move their customers to Phoenix under a veil of legitimacy. The shuttle operators are accused of giving illegal immigrants fraudulent receipts to make the trips look legitimate and coaching them on what to say if the vans were pulled over by police. "They are in knee-deep. They know exactly what's going on," said John Morton, assistant secretary of Homeland Security for U.S. Customs and Immigration Enforcement. Arrests were made in Phoenix, Tucson and two other Arizona towns along the border, Nogales and Rio Rico. Investigators also made arrests in Tennessee, and Mexican authorities detained people in the border state of Sonora. In all, 47 people were in custody, including the leaders of three smuggling operations. More than 800 agents from nine law enforcement agencies were involved in the bust. Dozens of agents in Phoenix — some wearing black hoods over their faces — swarmed a shuttle business early Thursday in a strip mall in a heavily Latino neighborhood. No one answered phone calls at two of the accused shuttle businesses, Sergio's Shuttle in Phoenix and Saguaro Roadrunner Shuttles in Tucson. There were no Tucson phone listings for the other three accused shuttle services. U.S. Immigration and Customs Enforcement touted the bust as the largest human smuggling case in the agency's seven-year history. 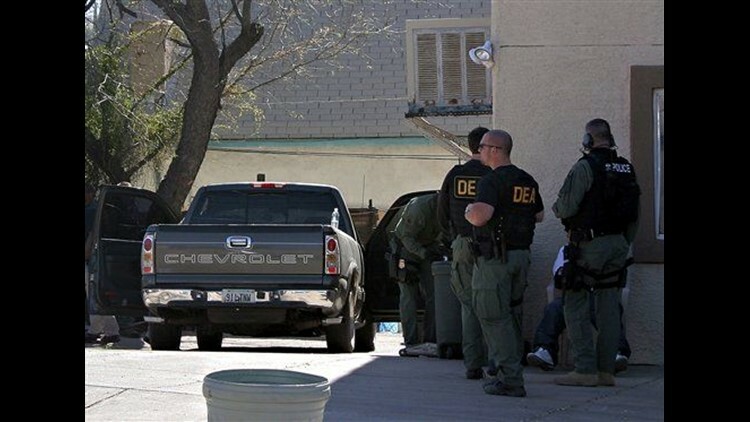 The raids occurred amid a heated debate over immigration in Arizona, the busiest illegal gateway into the United States for several years. Arizona is on the verge of approving a sweeping anti-immigration law that would make it a crime under state law to be in the country illegally while requiring local police to question people about their immigration status if there is reason to suspect they are here illegally. Jennifer Allen, director of the Border Action Network, a Tucson-based immigrant rights group, said the show of force by federal agents will ultimately hurt the cooperation they get from immigrant communities because residents will be less inclined to call authorities when they witness crimes. "If communities are afraid to call the police to let them know about criminal activity, criminal activity is going to go right to those neighborhoods," Allen said. Morton said investigators gathered evidence that will show the shuttle operators knew they were moving illegal immigrants, despite the claims of many other shuttle operators in the past that they were performing a legitimate service. "It's a calculated farce," Morton said of the five shuttle services. Investigators say smugglers would guide immigrants from the Mexican border 65 miles north to Tucson so that they could walk around Border Patrol checkpoints. Once in Tucson, the immigrants would get into shuttle vans would take them to Phoenix via Interstate 10, a route that is patrolled by police but doesn't have checkpoints. Immigration agents said the five shuttle businesses didn't perform legitimate transportation services, such as bringing customers to airports. "They didn't advertise at all, because they didn't need to, they had a built-in clientele," said Matthew Allen, the chief of investigations for U.S. Immigration and Customs Enforcement in Arizona. Forty-five percent of all immigrant arrests by U.S. Customs and Border Protection are made in Arizona, and smugglers use Phoenix as a hub for moving illegal immigrants across the country. The nation's fifth-biggest city has plenty of highways to move people around, growth that makes it easier for smuggling operations to blend into neighborhoods, and countless "drop houses," where immigrants are hidden and smuggling fees are collected before smugglers bring their customers into the country's interior. Smugglers have long gotten crucial help from some seemingly legitimate businesses that supply them with cars, lodging, plane tickets and other services. The accomplices have included landlords and rental agents who provide homes for smugglers to hide immigrants; taxi drivers near the border who bring immigrants to the closest cities; used-car dealerships that let smugglers register vehicles under false names; and travel agencies that sell blocks of plane tickets for immigrants.